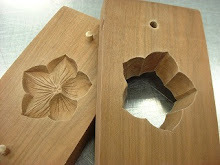 Here's a wagashi (traditional Japanese confection) recipe that may remind you of Chinese Dim Sum. I tweaked a recipe I found in Haruko Kanezuka's book Wa no Oyatsu (Japanese snacks). It is not overly sweet, as so many Western desserts tend to be, but that's only one of the reasons I like it so much. It's made from healthy ingredients, is quick to make from start to finish, has interesting texture, and is visually interesting too. 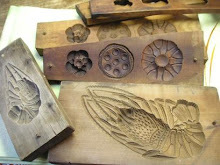 If the lotus root is fresh (un-packaged), peel it. 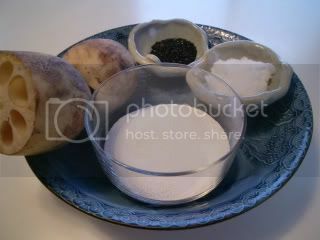 Cut 6 thin (3~4 cm) slices from it and put the slices in a bowl of cold water to keep them from oxidizing and changing color. 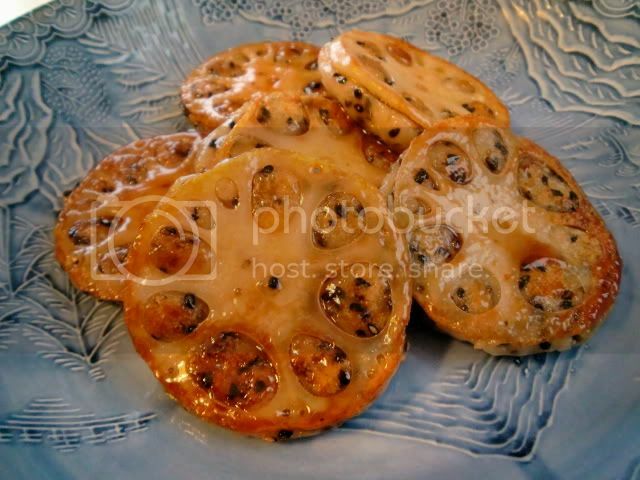 Grate enough of the remaining lotus root to make 100 grams (3.5 oz) worth. 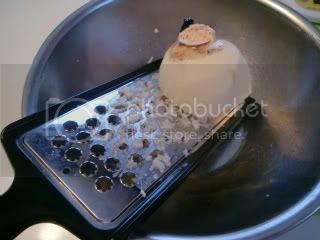 If using cheese, chop enough to make 5~6 teaspoons worth. 1. 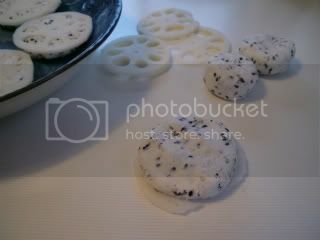 Place the shiratama-ko and the grated lotus root in a bowl and gently knead together to make a cohesive ball. 2. 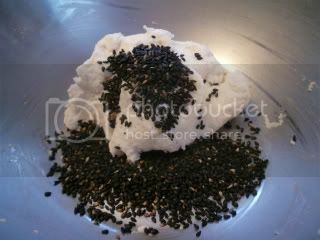 Add the sesame seed to the above, and knead till mixed evenly into the dough. 3. 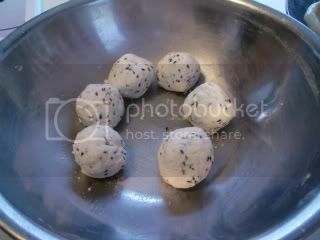 Divide dough into 6 equal balls. 4. Flatten each ball against the palm of your hand and place a teaspoon or less of chopped cheese in the middle. 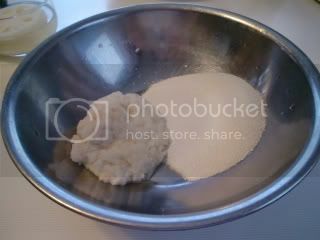 Wrap the dough around it and pat it back into a ball. 5. 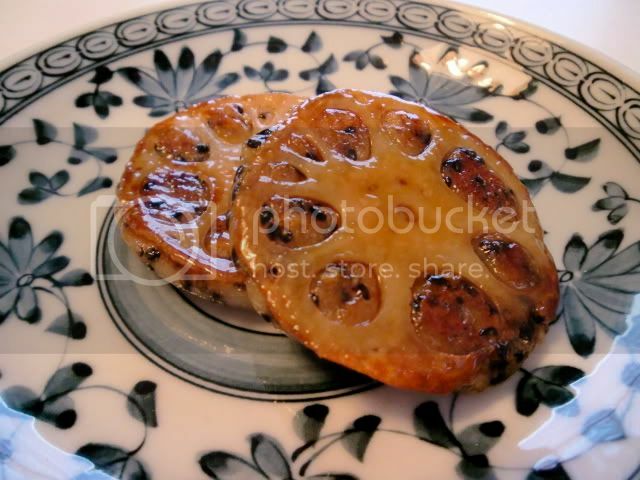 Pat the lotus root slices dry with paper towels, and flatten a dough ball against each slice. 6. Heat a little oil in a frying pan over medium heat. 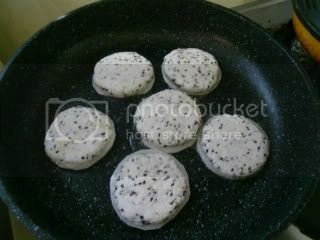 Then place all the lotus/dough patties in the pan with the lotus side down. Reduce heat to low, cover pan, and let steam-cook for 5 minutes. 7. Turn the patties over and steam-cook for 3 more minutes. 8. 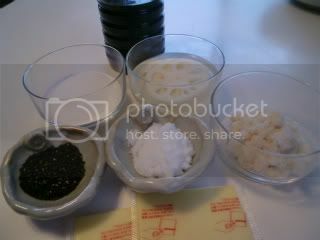 Remove excess oil from pan with paper towels, and then add the soy sauce and sugar to the pan. Stir with a wooden spoon or shake the pan to dissolve the sugar into the soy sauce, tossing the patties till they are coated with this sauce. 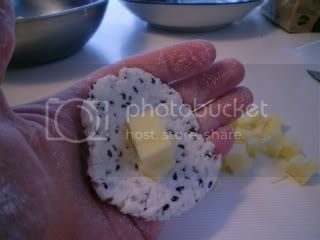 As an alternative, replace the cheese with a different filling, or leave the filling out all together. Either way, this is a delicious snack! Serve with bancha tea.